Macroalage can have numerous benefits to almost any tank. Within our disease-free systems, our algae receive 12hrs of a light each day with optimal water quality/flow. Orders are pulled from these systems the day of shipping and sealed in plastic bags. 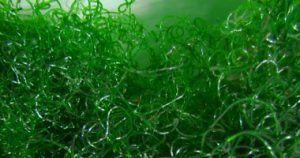 Chaetomorpha is commonly used within aquarium systems for uptake of nutrients/nitrate. Other than relatively quick uptake of nitrogen, Chaetomorpha is a great candidate for nutrient export because it won’t attach to rocks, pumps, etc. It is also less likely to undergo sexual reproduction than other similar macroalgae.